Anna Miller hails from Sioux Falls, SD and received a BA in Art and Art History from the University of Minnesota. Since then she's been showing steadily throughout the state in salons, restaurants, coffee shops, and galleries. Currently, she works at Wet Paint Artists' Materials, which allows for many opportunities to meet other artists and experiment with new materials. Her favorite mediums include acrylic, watercolor, ink, oil pastel, and the beloved Pentel Pocket Brush Pen. Generally, I like to draw and paint women. When looking for inspiration, I’ll leaf through a fashion magazine or one of my many pin-up art books. Themes change, but more often than not a drawing or painting by me is going to include a lady. My work is also very driven by color and I like to work with contrasting hues. My older works are saturated with bright reds and greens, whereas recently, I’ve been working with blue and orange. 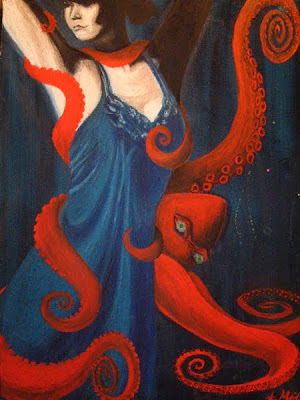 My two newest paintings depict a mysterious woman dancing in a blue abyss with orange and green accents. Some people have pointed out that I’ve taken a turn to a more nautical style, which may be true, but it’s entirely based on a tube of Old Holland, Indigo Deep that I fell in love with. This past year, I set out to create a self portrait each month. It was meant to be just an exercise, but it turned into a nice little body of work. Each drawing reflects my attitude towards that time of year and is a record of how I've changed. I think it would be interesting to continue this for a number of years, kind of like a growth chart for adulthood. "What is Art?" is certainly too big of a question to ask here, but how do you hope your art is perceived by your audience? Or what statement do you hope to make with your art? 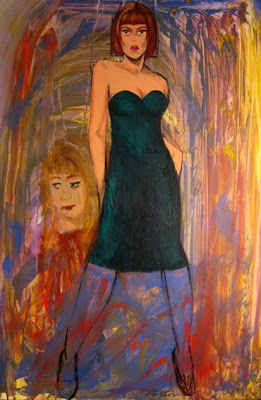 I include myself in many of my paintings and these works usually have a strong personal meaning. Painting can be a cathartic form of therapy that allows me to release frustrations and fears that I build up inside myself. A lot of the time, other people will interpret a meaning based on their own ideas and experiences that is not what I intended, but just as valid. This is what I love about making art. It opens discussions and there is no right or wrong answer. I like to suggest to the viewer a narrative and a sense of familiarity that they can take away with them to ponder and interpret. I’m not really into relaying a message through my art, be it politically or socially, but if someone gets that out of my work, I won’t dispute it. Above all, my intentions are to add beauty to my world. This may explain why I use a lot of feminine imagery, bright colors, and organic shapes. To me, that’s beautiful and I hope that others respond positively to that. 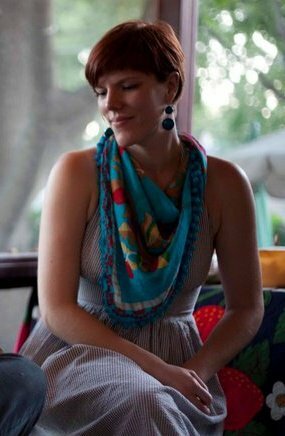 Avid visual journalist Roz Stendahl (http://rozwoundup.typepad.com) stresses that you shouldn't cover up your mistakes. I like this attitude because it allows for creative freedom in my artwork. I don't worry about what the outcome will be when I'm drawing in my sketchbook or starting a new painting, which is always so daunting. I tend to just let things happen and often times, the “mistakes” are what give the art life and make it interesting. Letting go can also be a learning process in discovering new techniques or knowing what not to do next time. I do have a studio in the basement of my house, but really, it’s just a space to keep all of my art supplies and collections of junk. In the summertime, I move my easel and paints up to my screened in back porch. Sometimes I'll spend the entire day out there painting, drawing, or reading. It's blissful. I wish I could use the porch all year round because the basement is just too cold and dank for creative thinking. I keep sketchbooks and carry one with me almost everywhere I go, so in reality, my working space is wherever I happen to be. I like to draw people and record strange situations in my sketchbooks, but I don't like to be noticed when I’m working. For me, drawing and paintings is a private act, but people are always interested to see an artist at work. I'm kind of a hypocrite because, here I am invading the privacy of strangers by secretly drawing them, but I get all defensive when they want to take a peek. My creative process is pretty spontaneous. I don’t do a lot of planning because I find that when I do, the outcome is stale and unexciting. When I start a new painting, I choose a couple of key colors, turn on some music, and intuitively move the paint around the canvas. More often than not this doesn’t create a final product, but a nice backdrop for a focus character. 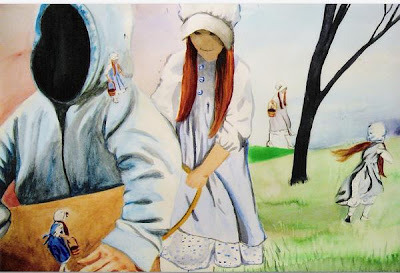 The main characters in my paintings are usually inspired by a photograph, either from a photo session with a model or some spontaneous act of awesome caught on camera. I participated in Urban Arts: A Night of Art and Burlesque last August and took a lot of photos during the burlesque show. These have been great fodder for new paintings. I recently discovered Michael Thomsen (http://www.mdthomsen.com) and love the tiny worlds he creates with found object. His style really reminds me of two other artists, whose work I admire: Mary Solberg (http://marysolberg.30art.com) and John Ready (www.johnreadyart.com). I've participated in two shows put on by Urban Arts (http://www.urbanarts-tc.com) and had the opportunity of showing with wonderful artists such as Kao Lee Thao (http://www.innerswirl.com), Mai C. Vang (http://www.chaosmaiart.com) and Chris Navarre. Other artists I've come to admire are Dan Weiken (www.danwieken.com) for his intricate pen and ink drawings, Chuck U (www.chucku.com) for his colorful and psychedelic urban illustrations, and Caitlin Karolczak (http://studiosilenti.com) for her haunting, monochromatic oil paintings that seem from another world and time. Also, I can't forget some of my talented co-workers at Wet Paint: Kristina Fjellman (www.kristinafjellman.com), Justin Terlecki, (www.mnartists.org/terlecki), Paul Damon (http://www.pauldamonlandscapes.com), Gregory Graham (http://www.gregorygrahamart.com), Dana O’Malley (http://www.danaomalley.com), Steve Robbins (www.comicartiststeve.com), Liz Carlson (www.mnartists.org/liz_carlson), and Kate Katzer (http://katzerova.blogspot.com). I don't generally go to galleries randomly. That is, I'm only going to see an art show if I've gotten a postcard that intrigues me or an invitation from somebody I know. 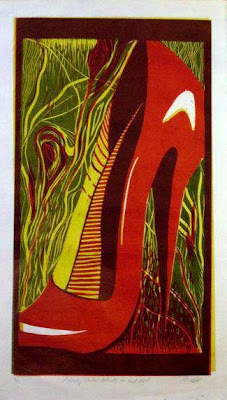 I’m a member of BlueCanvas.com, which is a social networking site for artists that also prints a quarterly periodical. I’ve discovered a lot of great artists through that site. I'm also a huge fan of Hi Fructose (http://hifructose.com). I don't visit the site as much as I devour the magazine. February 11 through March 11, I'll have work up at SpotArt gallery in Northeast Minneapolis. This is a group show with a lot of different artists and a variety of styles. I’m showing most of the monthly self portraits from 2010. I don’t have anything scheduled at the moment because I took a hiatus from showing to create new work. I'm starting to get out there again, so look for me when you're out and about. If you were to receive a $2,000 art grant to do anything you want, what would you do? A year and a half ago I did my first installation in my garage. 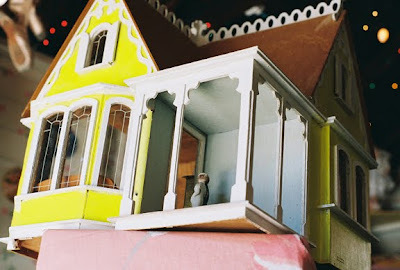 It was called All Dolled Up and it was based on the interior of a doll house from my childhood. All of the materials used were my own or handed down from my relatives, which worked for the nostalgic nature of the show. I have many more ideas for installations and would like to pursue these, but my resources are limited. If I had a $2,000 grant, I would put it towards building a name for myself as an installation artist.